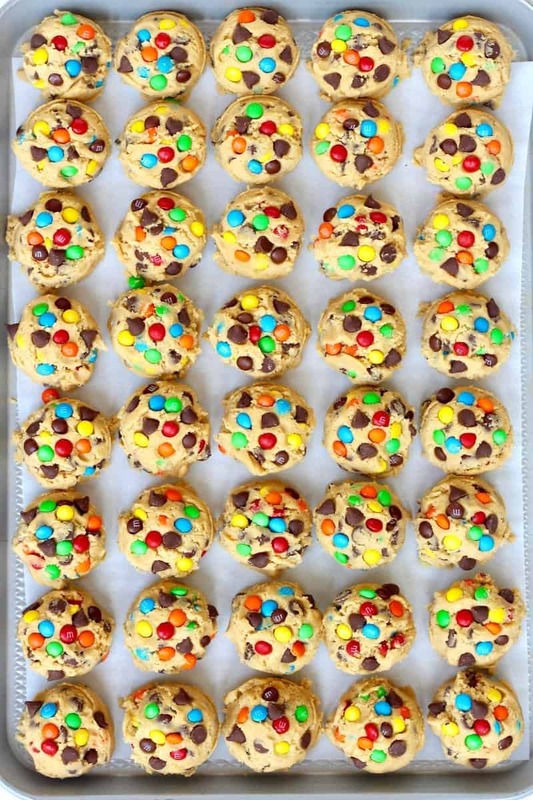 We can’t get enough of these amazing cookies! 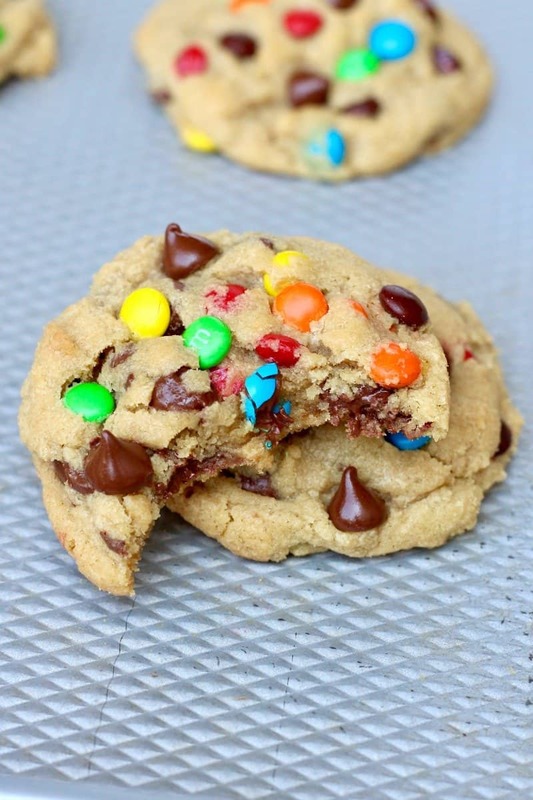 Vanilla pudding mix makes them perfectly soft & chewy while chocolate chips & M&M’s make them super sweet & chocolaty! Yummm! Happy Friday Eve, y’all! It’s my favorite night of the week! Friday is just fun that leads into the weekend, which is usually all about family, friends and lots of R&R! We love our weekends! The boys and I are always baking something fun and yummy on Thursdays so that we have treats to enjoy all weekend long! So we opened the pantry and out he grabbed the mini M&Ms, a bag of chocolate chips and a box of vanilla pudding mix! Looked pretty fun to me! I’d never baked cookies with a pudding mix, but I’ve seen the pudding mix cookie craze on Pinterest so I was excited to give it a try! Oh me! Oh my! 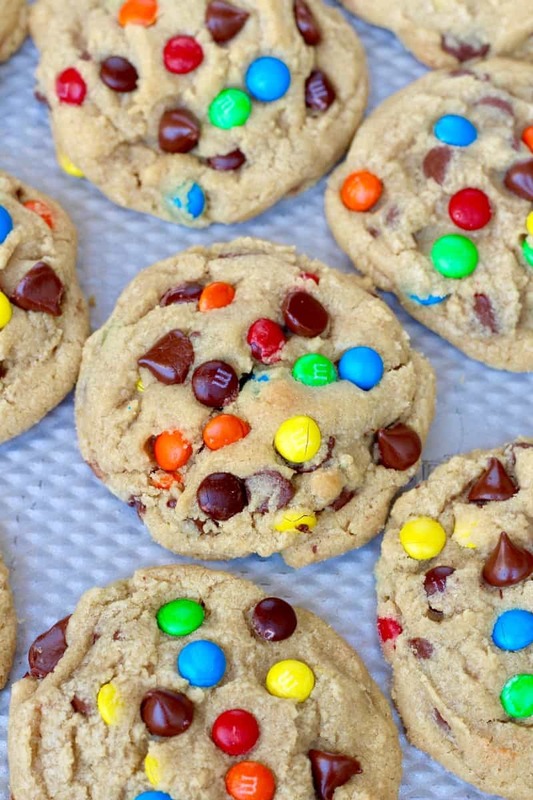 You’ve got to give these cookies a try! They’re the best. So soft and chewy and oh so chocolaty. Mmmm-azing! 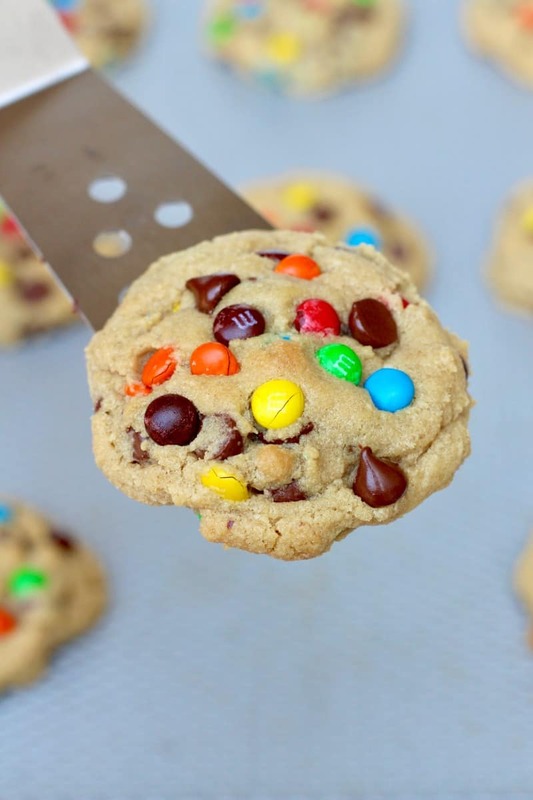 You can seriously have these cookies baked in about 30 minutes and everyone will go crazy over them! I’ve baked so many batches since that Thursday afternoon Baker and I created them that I now have the recipe memorized and I’m still mesmerized every time I bite into one. LOVE them! I’m 100% confident you’ll love baking and eating them as much as we do! 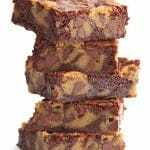 I hope they quickly become a favorite that you’ll be baking for your family and friends again and again! In the bowl of an electric mixer, beat the butter and sugars until smooth. Add the egg and vanilla and beat until well combined. In a separate bowl, whisk together the flour, dry pudding mix, and baking soda. Add the dry ingredients, 1 cup at a time, to the wet ingredients in the mixer until just combined. The dough will be thick and chunky. 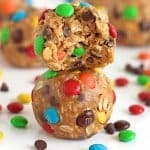 Mix in the chocolate chips and M&Ms on low speed or with a wooden spoon. Scoop dough into 2-tablespoon sized rounds and place a few inches apart on the prepared cookie sheets. 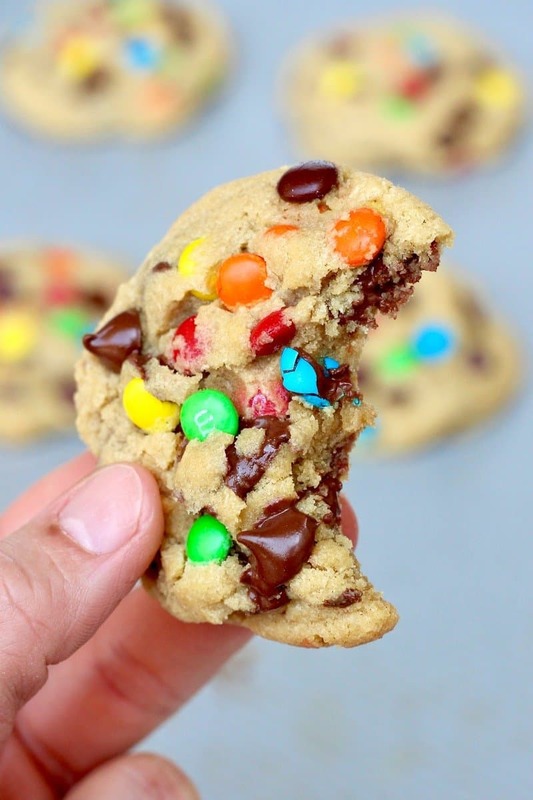 Press additional M&M's and chocolate chips into the tops of the cookies, if desired. Place in the freezer for about 10 minutes or the refrigerator for 20 minutes. 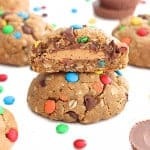 Remove from the freezer/refrigerator and bake for 12-14 minutes or until the cookies just start to turn a very light brown and barely crackle on top, rotating the cookie sheets after 7 minutes of baking. 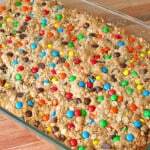 Let cool completely on cookie sheets or eat warm right away! Super easy, fun and delicious! Thanks for a yummy recipe! These were really awesome! The family loved them, but the one thing that was missing that I noticed immediately was the salt. Next time, I’ll add 1/2 tsp of salt. These were delicious but mine spread really badly all together on the sheet. Has that ever happened to you? I didn’t skip the freezer step but maybe made them too big? Hi Liz! Sorry, I’ve never had this happen with these cookies. They might have needed to be in the freezer longer if you made them bigger. 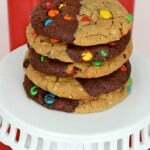 If I want to make it into a cookie cake (like pictured) how would I go that?